We’ve got a lot going on at the end of the week, as hard-working teams like ours tend to do! We even have mother nature putting on a show for us on both coasts, with a lot of ongoing snow fall. For us, in Virginia, it’s been snowing almost all day. This weekend, we are planning on a crafting and characters 2.0 test! This will be a first test of the new crafting UI, as well as a “help us find bugs” test on the new character art. *Be aware that Daylight Savings Time kicks in on Sunday. Everything moves forward by an hour. Stay tuned for an additional email with more information. We’ll CU there! Keep an eye on our tentative testing schedule next week for further testing. If you missed today’s livestream update and Q&A with Tim and Ben (and me – Tyler at the end.) you can find that HERE. UI – New Crafting UI: AJ has finished work on the new crafting UI, and it has been pushed to Hatchery for testing. Caleb has been busy adding armor penetration, resists, and arrow stats to the improved ability system. Anthony implemented a few lingering ability components and traits, and fixed some bugs as they were discovered. We are neck-deep in testing the abilities for functionality, and hope to have them pushed to a test with Backers shortly. Christina worked on getting progression hooked up to the improved abilities. This will allow the new abilities to scale as you use them. Christina also spent some time getting deflection working with the improved ability system. This is going to require some other upgrades within the system before it is completely implemented, but the base functionality is complete. WIP – Tech – Patcher: AJ updated the patcher’s style framework, which will boost the performance of the patcher by quite a bit. This change has been pushed to the experimental patcher for evaluation. WIP – UI – Ability Builder: James submitted the UI for the new ability builder for review. We will be tweaking the ability builder next week, and should have it ready for testing soon. WIP – Design – Armor definitions: Ben is reworking armor item definitions so that they conform to a smaller number of slots, and this will allow them to apply stats more effectively now that we aren’t using separate health bars for different body parts. 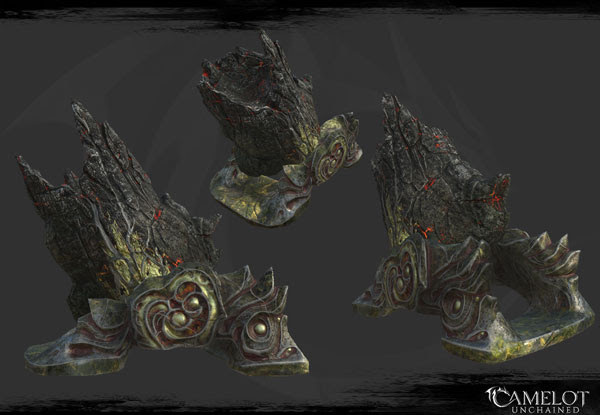 This work will also inform changes to the crafting system later. WIP – Tech – Building Physics: Colin worked on simplifying building physics meshes. This helps ensure that our servers can handle lots of buildings. Tech – Death: Rob has changed technical details of how we handle death, but it pretty much works the same on the surface. We now have the *capability* of easily adding more ways for everyone to kill each other, and generally the error tracking around it has improved–so we can be absolutely sure you’re dead. Tech – Created entities: Rob added support for having modifiers change the physics of created entities, e.g. making projectiles faster, clouds bigger, etc. WIP – Art – Magic Mortars: With the three models complete, Mike has finished the first pass on the VFX for the magic mortars. These will be temporary for testing, until we get a second pass in to spruce them up. WIP – Tech – Animation System Improvements: We have several little pops and hitches in our movement animations, especially when starting and stopping, as well as when abruptly changing directions. We’ve fixed several of these issues, and should have it in next week, with more improvements to come! WIP – Art – Characters 2.0: Better-looking and more performant characters! Status: Most of this week was spent cleaning up small, lower-priority issues, so we can get this into the hands of testers this weekend. 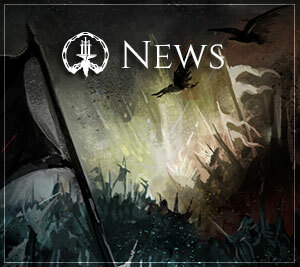 While minor bug fixing will continue, next week we’ll begin moving to other priorities for the relevant artists. LODs: We did some debugging of the supporting code this week with our first test assets. We have since imported about half of the new assets. Over the next week, we’ll continue adding in the required LOD models for all the races, genders, and classes, and we’ll tune them according to performance testing. 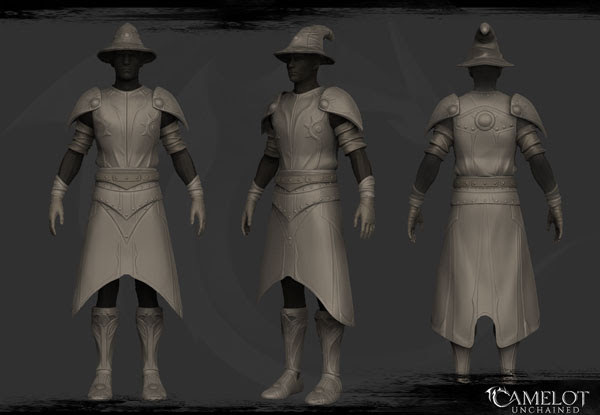 WIP – Art – Mage Outfits: Jon began work on the reskin of the Arthurian mage this week. 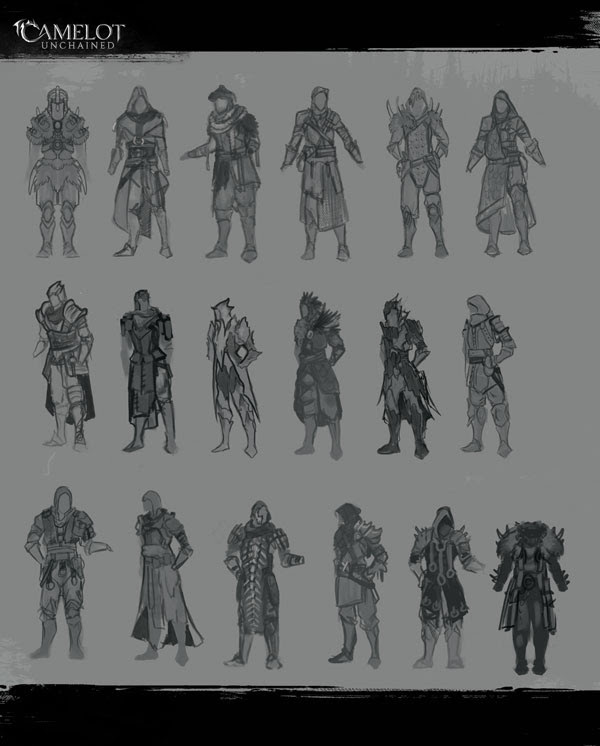 These outfits will be included in the default gear for mages to help differentiate them during the initial phase of testing. For art this week, we start off with a whole plethora of concepts for light, medium, and heavy armor! In this phase, we want to throw out a lot of ideas, then pick a few we’re interested in developing further. 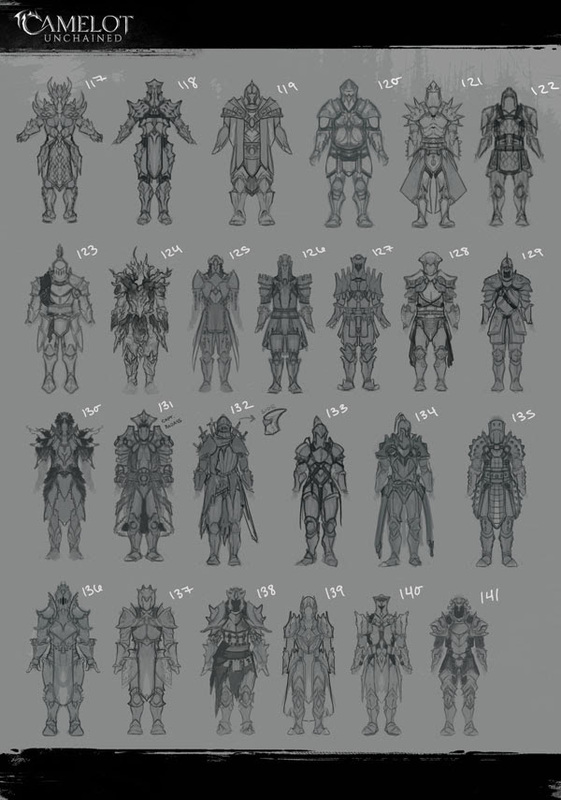 We start off with light, then medium, and then heavy armor concepts. 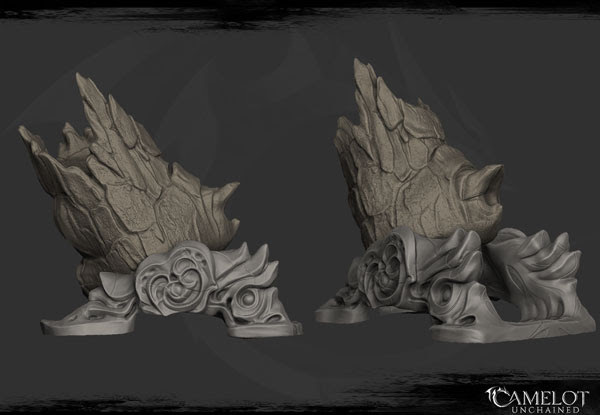 Next week, we’ll show off the next phase of this work, where we break out parts of these–such as pauldrons, shins, etc.–for further development. Next, we have the TDD magic mortar from Jon, both a high poly sculpt and one with materials, all nicely rendered out. You’ll soon have the opportunity to use these in-game! Lastly, we have the first pass of the high poly sculpt of the Arthurian mage armor, also from Jon. 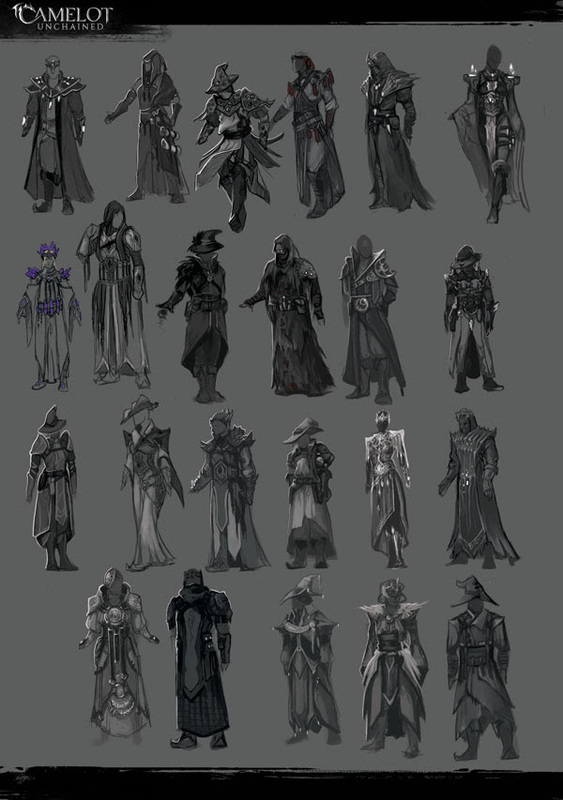 You can see the concept art from last week HERE. This Arthurian version of the outfit is one I’m really excited about, because I really liked the design and the old-school wizard hat. I keep looking over Jon’s shoulder, who sits next to me, as he works on it. That’s all for this update, everyone. Thanks for hanging out with us online in our streams, updates, tests, Discord, etc! We are very lucky to have such a passionate and patient group of Backers. We work hard every day to repay that kindness.